Our Elephants in Crisis campaign has focused on the plight of wild elephants in Africa. But did you know a captive elephant called Pole Pole is the driving force behind Born Free? 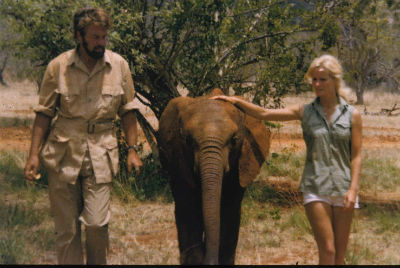 In 1969, Born Free’s Co-Founders Virginia McKenna and Bill Travers starred in the film An Elephant Called Slowly with a two-year-old female elephant calf called Pole Pole. The film told the story of their adventures with three young elephants while house-sitting in Kenya. Pole Pole was taken from the wild by the Kenyan government as a gift for London Zoo. Virginia and Bill heard she was being kept in a yard in Nairobi and went to visit her with elephant conservationists David and Daphne Sheldrick. They were given permission to use her in the film. Virginia has never forgotten her first meeting with Pole Pole. “We went to Nairobi, and there was this little elephant absolutely distraught, as you can imagine, bashing itself against the side of its pen,” she says. When filming was over, Pole Pole was gifted to London Zoo. Virginia and Bill did everything they could to prevent this but Pole Pole was still sent to London. In 1982, Virginia and Bill went to visit Pole Pole at the zoo. Alone and in clear distress, Pole Pole remembered Virginia and Bill and stretched out her trunk to reach them. “It was probably one of the most agonising moments that I can remember,” Virginia says. Virginia and Bill launched a campaign to give Pole Pole a better life. 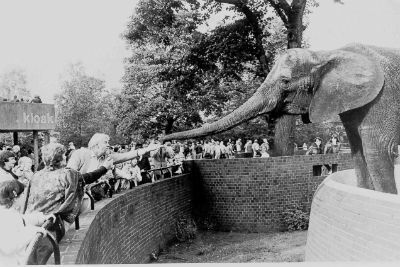 In 1983, London Zoo said they would send her to Whipsnade where she could be among other elephants. However, kept in her travelling crate for many hours, she collapsed and was subsequently put down. She was just a teenager. Determined that her death would not be in vain, in 1984, Virginia, Bill and their eldest son Will launched Zoo Check – the charity that has evolved into Born Free. Nearly 35 years on, Pole Pole remains firmly at the heart of everything we do. We continue to oppose the exploitation of wild animals in captivity and campaign to Keep Wildlife in the Wild. In 2013, we launched our Innocent Prisoner campaign to highlight the plight of elephants kept in solitary confinement across Europe. And through our latest Elephants in Crisis campaign we are preserving and protecting African elephants in their natural habitat. Elephants never forget – and Born Free will never forget Pole Pole.